Christine DeRosa/Contributing Photographer Gilbert Kaplan, U.S. Under Secretary of Commerce for International Trade, speaks at the fifth annual Global Trade and Investment Forum on Wednesday. Endicott native Gilbert Kaplan, U.S. 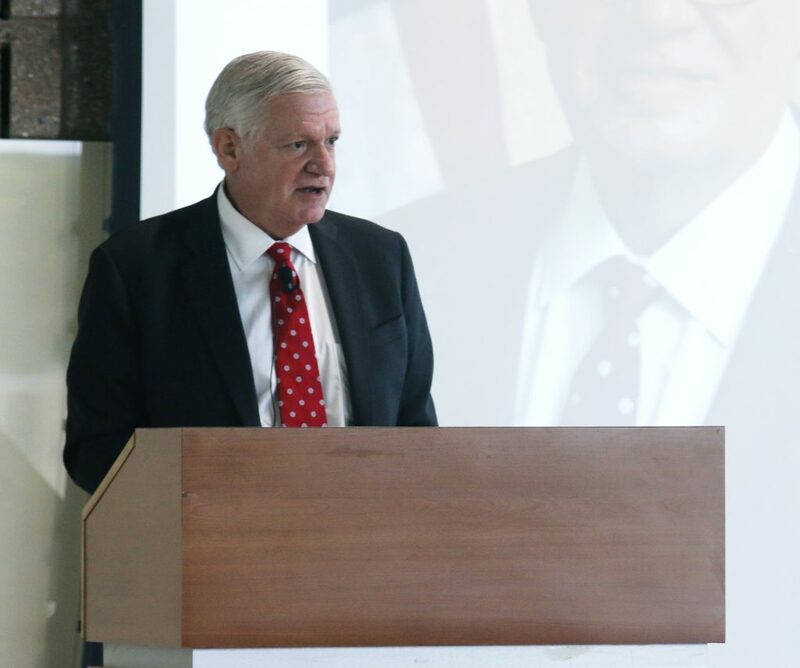 Under Secretary of Commerce for International Trade, returned to the Southern Tier to discuss economic development and revitalization in Broome County at the fifth annual Global Trade and Investment Forum on Wednesday. Hosted by the Center for International Business Advancement, an organization dedicated to increasing the global awareness of the local academic, business and policy communities in the Southern Tier, the forum was held in the Smart Energy Building of Binghamton University’s Innovative Technologies Complex. Kaplan spoke to an audience of about 70 people, including business leaders and small business owners in the Binghamton area. According to Kaplan, there is potential for small businesses, particularly in Binghamton, to reach foreign markets, which would allow the city to return to an era of industry. “Our administration has put focus on the American worker and American manufacturing, fighting for workers and companies, enhancing and protecting and demanding protection for technological innovations across the world and ultimately bringing jobs back to America,” Kaplan said. Nominated by President Donald Trump in March 2018, Kaplan said he played a role in the administration’s efforts to bring back jobs to the United States and combat unfair business practices conducted by China. In 2007, Kaplan filed and prosecuted the first successful anti-subsidy case against China, which he says has stolen intellectual property, practiced unfair licensing terms and continually forced the United States to make sacrifices to get into their market. Kaplan also discussed how his upbringing in Endicott shaped his views and allowed him to understand how important manufacturing is to communities like Broome County. Kenneth Kamlet, an attendee and an attorney at Hinman, Howard & Kattell LLP, said Binghamton has many advantages, including its location, history with IBM and access to research institutions like BU and Cornell University. He said he hoped to learn about how this community can benefit from and access the opportunities that come from foreign and globalized industries. Kaplan said he is optimistic about America’s future role in global markets and hopes the Binghamton area will benefit from the current administration’s emphasis on rejuvenating communities that suffered from the loss of manufacturing jobs. Lakhsmi Chatterjee contributed reporting to this article.